Other Pages To Look At..
re: CUTE KIDZ CONTEST PRIZE WINNERS! 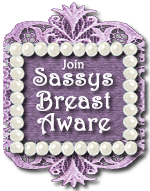 Join Sassys 'Be Breast Aware Award'! I’ve always dreamt of being a Mum. I can remember being about eight and the teacher asking what I wanted to be when I grew up. In my head I could hear a voice screaming... I want to be a Mum! but I was far too switched on and realised that my teacher wanted to hear something other than that so I said ... I want to be a vet, Miss. A vet? I hate blood and guts. I don’t know where that came from. I haven’t once, beyond that moment considered being a vet. We don’t even have any pets now. I am so not a vet type person. From that ripe old age of eight, when I was already clucky I would happily mind any kid, and I did a good job too. Kids and babies felt safe with me. They were drawn to me. I can’t explain it, but I was just very maternal from the beginning of my time. I’ve always kept my cluckiness under control. When I met Hubby I wasn’t banging down his door demanding babies. Quite the opposite, in fact. After we married he would have happily had children straight away. Instead, I wanted to wait for a year and a bit until we had enjoyed that post-wedding bliss together. I knew we wouldn’t get that time back. Or the sleep. Becoming a Nanny was a pretty natural path for me. I don’t mind other people’s children. I know others gag at the thought of being around kids that aren’t their own, but I love them. Any age. Any stage. I’ve always loved that I can be that person for the kids. The person that makes them smile. Makes them giggle. Loves them. Nurtures their needs. I really do love the kids I Nanny for. When I fell pregnant I had always looked forward to breastfeeding. It sounds odd. A bit weird, perhaps. I guess that as a Nanny it’s the one thing I can’t do for a child (well I could, but that’s borderline crazy!). I knew that I would breastfeed no matter what. It was important to me. I wanted to be able to provide for my child. Moments after I gave birth to Lacey there was a midwife squeezing, expressing and trying to attach my baby to my breast. Umm....ouch! I was looking forward to this? I thought it was meant to be beautiful and peaceful. That was pure pain. I remember the weeks after arriving home having to stomp my feet every time she would attach because the pain was insane. After a while it got easier, and quicker, not to mention much more enjoyable for Lacey and I.
It’s pretty special to be able to provide for my little one. It’s very natural. It’s a special moment (or a series of them throughout the day) to share with Lacey. Lacey is ten and a half months old now, and the months that have passed have seemed like a blur. I can’t remember what she was like as a teeny little baby. I see newborns and wonder if she was ever that small. I know she was. Perhaps even smaller.